After recently reviewing the highly regarded Kai Japanese whetstone here on Sharpen-Up, we thought we should also check out the competition. 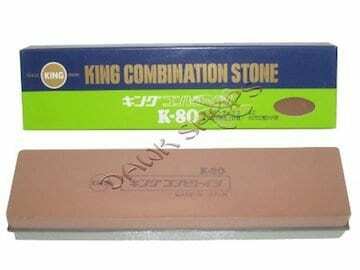 The King K80 Japanese Sharpening Stone definitely falls into the category. Using the same grade combination grit: finest medium grey #1000 grit on one side, #250 grit on the other – performance wise you are getting a very similar tool indeed. Let’s take a closer look. Made in Japan, the King K80 whetstone can be used on the usual array of knives you would expect for such a sharpening stone, namely cleaver, fruit and sushi knives. Much like the Kai Japanese stone – King also highlight that the K80 can be used to maintain your samurai sword collection. Again, if you happen to have a few laying around, this stone could be the one for you. Performance wise the K80 sharpening stone comes much praised. The stone used for the combination grit is of high quality, with the lower 250 grit recommended for taking out chips and reprofiling your knives edges. The finishing #1000 grit does the job nicely, however some commentators have mentioned that to finish off the sharpening with a separate #3000 or #4000 whetstone will provide the best results. One top tip is to use a small metal binder clip onto the knife before sharpening. This helps give you the 22 degree angle that you require. Remove the clip, maintain the angle and away you go. Although some found using the King K80 stone sharpener to be a little tricky, there are some great independent guides on using combination whetstones on Youtube. (See below). Overall, a highly recommended Japanese Whetstone and a viable alternative to the Kai combination stone. combination of #1000 Grit and #250 Grit.